Facebook CEO and founder Mark Zuckerberg rang the opening bell remotely, from company headquarters in California. NEW YORK (CNNMoney) -- Facebook's stock market debut finally came and went -- but for all the breathless hype, shares ended right near their offering price. 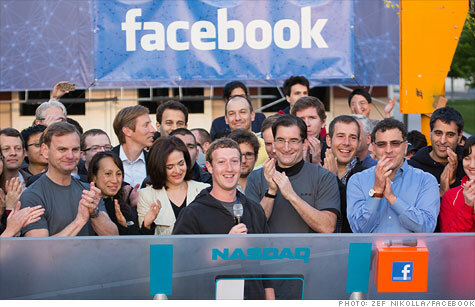 On Thursday night, Facebook (FB) set its final IPO price at $38 a share. When the stock began trading at 11:30 a.m. ET on Friday, the first trade came in at $42.05 per share -- a gain of nearly 11%. But the stock quickly reversed course, dropping down to hover right around the $38 IPO price for much of midday trading. Though shares rose modestly for short bursts of time throughout the day, they ended the session at $38.23. While the price itself didn't move much, trading was fast and intense. More than 80 million shares changed hands in the first 30 seconds of trading. By the end of the day, volume had spiked to around 567 million shares. That easily set a new volume record for IPOs, smashing the previous record that automaker General Motors (GM, Fortune 500) set in 2010 with trading of around 450 million shares. Facebook's trading had been expected to start around 11 a.m. ET, but the opening was delayed. Facebook founder and CEO Mark Zuckerberg rang the Nasdaq opening bell remotely, from the company's headquarters in California. Facebook celebrated its public debut by gathering its staff Thursday night for an all-night hackathon. At the $38 IPO price, Facebook is on track to raise $16 billion -- making it the largest tech IPO in history. It's the third largest U.S. IPO ever, trailing only the $19.7 billion raised by Visa (V, Fortune 500) in March 2008 and the $18.1 billion raised by automaker GM in November 2010, according to rankings by Thomson Reuters. Underwriters have the option to purchase an extra 63.2 million shares to cover any so-called over-allotments for excess demand. If that happens, Facebook will sell 484.4 million shares in total. That would bring the amount raised to $18.4 billion. How much Facebook is worth: At $38 per share, Facebook's market capitalization would be around $81 billion on IPO day. Many Facebook employees and executives hold unexercised stock options. If all of those shares were exercised, Facebook's outstanding share count would rise to around 2.8 billion -- pushing the company's total valuation closer to $107 billion. Among all global companies, Facebook has the third-highest IPO-day valuation in history, according to data from DealLogic. SecondMarket, an exchange on which people can buy and sell stock in private companies, posted data on Friday about Facebook's private-trading history. It wasn't until 2010 that SecondMarket's Facebook trades racked up significant volume, so Facebook's trades before that tended to be one-off deals at a low per-share price. In April 2010, Facebook fetched an average price of $9.82 per share on a monthly average basis. One year later, the rate jumped to $31.46. As of April 5, Facebook shares were trading for an average of $42.72 each -- nearly $4 higher than the IPO price. Who's selling shares: Zuckerberg plans to sell 30.2 million shares in the IPO offering. That will net Zuckerberg about $1.1 billion. But Zuckerberg won't be hanging on to his cash. Facebook said he will use the "substantial majority" of the windfall to cover the massive tax bill he'll be hit with, thanks to his plan to exercise a large stock-options grant that will increase his ownership stake in the company he founded. After the offering, Zuckerberg will still hold 503.6 million shares, or about 31% of the company. That stake is worth $19.1 billion at the IPO price. Venture capital firm Accel Partners, which is the largest shareholder outside of Zuckerberg, is selling 49 million shares in the offering. That's about a quarter of its Facebook holdings. -- CNNMoney's Chris Isidore and Maureen Farrell contributed reporting.